The Mississippi Gulf Coast has weathered its share of calamity. The devastating force of Hurricane Katrina and the widespread publicity surrounding a Gulf oil spill challenged the charming coastal communities of the Magnolia State. People here are accustomed to bouncing back from hardships, and they welcome visitors to places that often feature prices that are lower than more famous coastal towns in nearby states. There's much to do on the Gulf Coast ranging from exploring its natural beauty to checking out historical sites. At one time, the alley area between 13th and 14th streets was run down and a growing source of concern in Gulfport. It was time for a change, so some area artists partnered with business owners to create the art of colorful Fishbone Alley. Reclaimed brick forms the roadway, and various quirky art objects adorn the walls and patios. The murals are fun to photograph at this free attraction. There's often music and special events in the area. Fishbone Alley adds to the reasons you'll want to visit the second-largest city in Mississippi. Front Beach, along the Ocean Springs waterfront on Front Beach Drive, is a great place to spend a leisurely day. The sand here is sugar-white, the type you see in postcards and travel brochures. The water tends to be fairly shallow and calm, allowing families to feel comfortable for a day of fun, and the crowd here usually is laid back and friendly. One ranking places this as the Top Beach in Mississippi. The beach has a nice walking/running path that in-line skaters also use. It runs about a mile between the harbor and the bridge. Restrooms, a picnic pavilion, and volleyball nets are available for public use. During Hurricane Katrina, sections of U.S. Highway 90 were washed out for months. That's because the scenic route hugs the coastline in a number of places. Unlike some other free scenic drives, this one does not include spectacular mountains and rocky breakwaters. But the quiet beauty of the Gulf of Mexico and the white sands make for an enticing view. Crossing St. Louis Bay on the west, U.S. 90 is a beach highway for 36 miles, passing through Henderson Point, Pass Christian and Long Beach before entering the urban Gulfport and Biloxi beach areas. You'll find places to park and simply walk on the beach in areas such as Ocean Springs and Long Beach. After Hurricane Katrina, the remains of some of the damaged trees were carved into animal shapes. Such is the resiliency and creativity of the folks who live along this route. Unless you're in quite a hurry, U.S. 90 is a far more interesting route than its northern parallel partner, Interstate 10. Within the national seashore is the Davis Bayou Trail, a two-mile route that takes visitors through a coastal forest. There is no cost for using the trail, but there are fees for using the adjacent boat ramps or campsites. Another free site here is the William M. Colmer Visitor Center, where you can see a video presentation that introduces the national seashore and perhaps join a ranger-guided program or two. Ocean Springs is known as the Discovery City since it was here that the French first established a settlement in 1699. Today, you'll discover a quaint, inviting business district filled with shops, restaurants, and art galleries. You'll find studios to visit in this art-oriented community, including The Pink Rooster, which features paintings, glass, jewelry, and pottery. If there is a day during your trip when the weather doesn't cooperate with beach plans, a nice half-day alternative is to wander among the shops and galleries of Ocean Springs, an activity that won't cost a dime. Within the Mississippi Sandhill Crane National Wildlife Refuge, the Fontainebleau Nature Trail leads you through a bayou habitat. 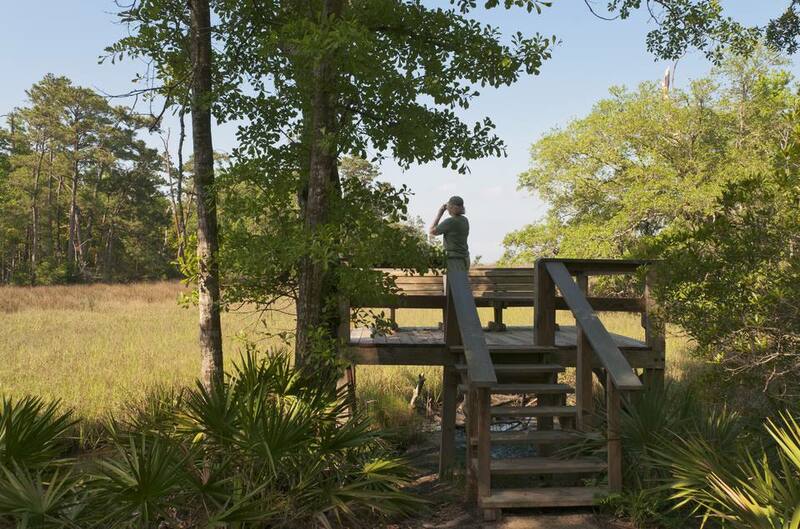 Two observation platforms are provided for bird watchers or those who want to spot an alligator or two. Be sure to take advantage of the crane views, as they are an endangered species in this area. Efforts are underway to stabilize their population. Waveland is on the western Mississippi Gulf Coast, near the border with Louisiana. Among the hardest-hit communities during Hurricane Katrina, it now hosts the Ground Zero Hurricane Museum. Exhibits here tell stories of death and destruction, as well as rebuilding and recovery. Even some humor enters into the story at times. No admission is charged, but donations are accepted and appreciated. Private gifts are needed to keep the place open and preserve the stories for generations of new visitors. In 1966, a star-studded movie called "This Property is Condemned" hit theaters. It was Francis Ford Coppola's first screenplay. The film was set in fictional Dodson, Mississippi, and shot in Bay St. Louis. The Starr Boarding House was to be condemned in the movie, leading to the title of the picture. Talk about irony: After Hurricane Katrina, this structure was condemned in real life and scheduled for demolition. But the Bay St. Louis Theatre came to the rescue, purchasing and restoring the building after their own building was wiped out in the storm. You can now walk around the former movie set, including the train depot that now serves as the Hancock County Tourism Office. The Mississippi Gulf Coast boasts 26 piers, from Waveland on the west to Vancleave on the east. Perhaps the four most-popular piers are Garfield Ladner Pier in Waveland, Biloxi Lighthouse Pier, Ocean Springs Front Beach Pier, and Pascagoula Riverfront Pier. Although enjoying the piers is free, be certain you have a fishing license if you cast a hook or net. A one-day saltwater license is $10 for state residents and $30 for out-of-staters. You don't need a license to catch some beautiful sunrise or sunset photographs from the piers. They are also great places for a walk during daylight hours. The Ocean Springs Fresh Market is open every Saturday, rain or shine, from 9 a.m. until 1 p.m. The produce offered comes from smaller growing operations in the region, and it's frequently possible you'll speak face-to-face with the person who cultivated the items you purchase. The offerings change depending on the season and the weather, so, you'll never know what you'll find in the market. It makes a nice weekend diversion, and you're likely to strike up some interesting conversations with the vendors.